Knowledge is widely regarded as a crucial organizational resource. In the pursuit of finding novel solutions to problems, organizations combine and re-combine knowledge and resources in different ways. This ultimately leads to innovation, which often is viewed as the ultimate reason d'être for organizations. While there exists a rich literature strand on knowledge management, the pervasive digitalization of entire industries creates new challenges. Different areas of knowledge are converging and organizations struggle with managing the rapidly increasing amount of heterogeneous knowledge. An increasingly popular approach to master the challenges of knowledge creation and recombination in the arena of digital innovation is the creation of Digital Innovation Labs (DIL). Although DILs provide a promising approach to the current challenges of innovating in a digital environment, we have only limited insights about DILs. To uncover how DILs facilitate knowledge management and recombination we conducted several case studies in different industries. Our results show how knowledge enters the DIL, how knowledge is applied and recombined and how knowledge is exchanged between units. Most importantly, we identify six key mechanisms that DILs use to master the challenge of knowledge management and innovation in a digital era. Digital innovation already disrupted numerous industries and organizations are challenged to align their innovation efforts with the new reality of a digitized environment. We examine how internal reorganization and the external network of an organization are related to organizational knowledge and the eventual creation of digital innovation. To develop digital innovation, firms tap a variety of heterogeneous backgrounds to exploit the ease with which different knowledge fields can be accessed and recombined in a digitized environment. Therefore, the actors involved in the development process come from different sources from within and without the firm as the inclusion of digital technology challenges previously non-digital organizational innovation logics. We develop a conceptual model, which takes the characteristics of digital innovation into account. How can the involvement of employees in process innovation be supported and fostered? 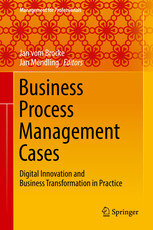 In this study, we investigate how the use of business process management systems - tools to design, visualize and document business processes - leads to employees (= users) become more process oriented and thus get engaged in process innovation. Using data from a large-scale survey with 171 participants from the financial industry, we show that BPM system usage mainly drives users' involvement in process innovation implementation and championing but less in the true idea generation. Thus, our study contributes to the IT benefits literature in shifting the focus to individual use and 'softer', but yet highly important outcome dimensions (process innovation). We address how organizational reconfiguration and external knowledge leverage is related to a firms' knowledge recombination ability and digital innovation success. To develop digital inno-vation, firms tap a variety of heterogeneous backgrounds to exploit the ease with which different knowledge fields can be represented as digital artifacts. We conceptualize that firms need to be aware of a fluid and dynamic recombination space that faces frequent adaptions and great time pressures incurred by customer demand. Therefore, the actors involved in the development process come from different sources from within and without the firm as the inclusion of digital technology challenges previously non-digital organizational innovation logics. We further theorize that a climate conducive to collaboration within the recombination space motivates all actors to engage in knowledge recombination. In times of digital transformation banks need to behave agile and increase their speed in IT. At the same time, they are bound by an increasing number of regulatory rules at an increasing pace that force them to act carefully. Since governments frequently introduce new regulatory terms, especially in the finance sector, regulation is a changing phenomenon itself, which forces banks to adjust and change their systems constantly. To manage these challenges, we argue that successful businesses need to have a flexible IT architecture in place. This should enable them to update and reconfigure their systems in a cost effective and prompt manner. By doing this, they should be able to compensate for the regulatory pressure and remain agile. Based on an analysis of 119 survey results, we find that business agility is indeed lower for higher regulatory pressure and that this effect is mitigated by a flexible IT. The changes in the business environment due to digital technologies and an increasing pace of innovation, have to be reflected in the organizational design of firms. In particular, agility has been put forward as an approach to cope with upcoming changes and to ensure organizational effectiveness in times of digitalization. We conceptualize agility as two types - detecting and reacting agility. In this paper, we analyze the organizational design and identify determinants for these two types of agility within the design. In our empirical study, we identified agility as a determinant of organizational effectiveness and discuss the relevance of agility in new forms of organizing in today's business environment. Our research is based on a quantitative study in the professional services industry where we conducted a survey with 217 respondents. The findings of our study carry theoretical contributions regarding the determinants of agility in the organizational design and the further delineation of detecting and reacting agility. Both of them carry essential importance for the design of digital organizations. Building on that, we derive managerial implications that yield the need to update the organizational design. In addition, we determine new forms of organizing and anchor agility as a management objective for digital organizations. To increase the performance of IT-intensive organizations, a mutual understanding between business and IT professionals has proven to be crucially important. In turn, architecture management - leading to modularization and flexibilization of an organization's IT infrastructure - drives the level of mutual understanding. While previous studies agree on this finding, conceptualizations on mutual understanding are quite dispersed. In our study, we focus on the differing effects of business process modularity and IT flexibility on operational and strategic aspects of mutual understanding. We combine two theoretical lenses to describe this linkage: the template theory to explain the sense-making process and the work system theory to consider different perspectives on a business system. Based on 119 survey results, we find that modularity does not enable business/IT mutual understanding per se. It rather depends on a perfect match of functional and technical aspects. Thus, we determined limited effects of architecture management on mutual understanding. Due to increasing specialization of business models, business systems nowadays can be very complex. To handle the extensive amount of information in a complex business system, the system needs to be supported by an appropriate IT system. However, for the IT unit it can be a challenging task to implement an appropriate IT system in complex business environment. In our research, we argue that mutual understanding among business and IT plays a critical role in the successful management of the business system. To achieve a mutual understanding, the complexity needs to be reduced by a modularization of the system. In our empirical study, based on 119 survey responses, we found that process modularity only in combination with an IT architecture that matches the modular process structure enables a profound mutual understanding. While modular business processes enable mutual understanding of the business strategy, an IT architecture which matches the modular process facilitates mutual understanding of the business process. Many companies aim to switch from a function towards a process orientation, as the latter provides many benefits for organizations. However, many of these projects fail because of a missing process-oriented mindset among employees. To create the relevant mindset and foster process-oriented thinking, organizations can apply several learning modes. Another promising approach is the use of a business process management (BPM) system to gain a process orientation among employees. Our study aims to examine the role of a BPM system along with job construals (a high perception of embeddedness of their own tasks in the overall process) as a mediator regarding the process orientation of employees. We use data from a survey of 1,170 employees of a multinational company to show that the use of a BPM system as well as job construals has a significant positive effect on employees' process orientation. While research and practitioners agree that there needs to be shared understanding (SU) between business and IT in any type of collaboration to achieve high performance, empirical studies ex-amining SU have always focused on specific contexts. Thus, the literature has so far remained silent about a more generalized concept of SU that can be applied to different research contexts - like strategic planning, software development projects, or IT operations. Based on a generic multi-dimensional conceptualization of the SU construct, our research objective is to analyze the influence of two contextual characteristics - complexity and relevance - of a collaborative task between business and IT on the importance of these different SU dimensions. In this explorative research we exploit data from 21 case studies, in which we analyze the formation and influence of SU dimensions related to the context of the collaborative task. We find that different aspects in the conceptualization of shared understanding become more (or less) important when changing the task characteristics. Thus, our findings indicate that the importance of SU cannot be discussed separately from the practical context in which SU is created and utilized. Many organizations aim to standardize their processes to increase performance. Organizational governance is an important driver for successful business process standardization. A central role within this governance structure is performed by the process owner who is responsible for the definition of processes. In this paper, the effect of different possible configurations of assigning process ownership in an existing organizational multi-level hierarchical structure is analyzed by conducting an embedded case study. The most important finding was that in most cases process ownership was assigned to a person who was already line manager for a single business unit which was responsible for executing a part of or the whole process. Thus, responsibility for the process itself and for the required resources (e.g., personnel) was combined. Based on these findings, we plan to conduct a study to analyze the impact of the different process ownership assignments on the success of process standardization. A lot of companies struggle by shifting the focus from function orientation to process orientation, especially due to missing process-oriented thinking and behavior of their employees. While, enhancing employees' knowledge about processes by training and empowerment has been considered as the sole adjusting screw to influence process orientation, the characteristics of the jobs, in which the employees work, were not considered in the same extent. As the daily job and its related characteristics represent the core of individuals' working life, we examine in our paper how these perceived job characteristics influence employees' process orientation. Therefore, we develop a research model on the influence of five job characteristics - autonomy, feedback, skill variety, task identity, task significance - on employees' process orientation and evaluate the model by using data from a field survey with 191 employees of a global service company of the aviation industry. The results depict that autonomy, feedback and task significance are all significant predictors for individuals' process orientation. By considering job characteristics, organizations can successfully shift from function orientation towards process orientation. Business process standardization (BPS) is an important instrument for transforming an organization from function orientation to process orientation. But, standardization initiatives' implementation success is highly volatile. One major reason for failure is the behavior and the underlying job-related attitude of the affected employees. Recent research examining BPS implementation success proposes that different factors of employees' current jobs (e.g., job characteristics) influence employees' acceptance of BPS-induced changes. Besides these motivational aspects, IS research has shown that non-adoption of a system is influenced by inertia of the employees. Our research-in-progress paper draws on these findings and aims to analyze the role of inertia in the context of BPS. The contribution of this paper lies in developing a theoretical model for understanding the determinants of individual inertia in the context of BPS. By knowing the influential factors, we will be able to derive adjustable screws for practitioners to successfully implement process standardization initiatives. As technical division of the Lufthansa Group, Lufthansa Technik and its 30 subsidiaries have to fulfill a wide variety of legislative and normative requirements. To demonstrate and ensure compliance with these requirements, Lufthansa Technik introduced the process-oriented integrated management system IQ MOVE and modeled a wide range of its processes in a plain and simple to understand methodology. Primary target group of the system are the employees who shall find all relevant procedures quickly and easily. To achieve this vision, the system is designed to increase involvement of all relevant roles (i.e., process owners, process architects, process managers, employees, and process modelers) into the creation of the content. A complementary governance model, the Framework for Assignment of Responsibilities (FAR+), enables a clear assignment of process management tasks and thus helps trengthen process management abilities and sustainability of their implementation. Based on IQ MOVE, Lufthansa Technik is able to facilitate process standardization and to lead 20,000+ employees around the world in a process-oriented way. Outsourcing initiatives are complex undertakings requiring careful management of the client/vendor relationship. While monitoring the vendor's performance is a common practice, insight into the status of the 'soft' aspects of the relationship, such as trust, is often not available, although research highlights the social aspects as a critical success factor. However, monitoring the softer facets' quality is difficult: Vendor managers track the status of the soft aspects, if at all, using survey tools among involved staff. This has shortcomings because it does not only capture subjective perceptions, but also interrupts the daily business of the participants. To develop a more objective instrument that collects data without interfering daily business, we draw on social network analysis. We suggest an approach that will eventually allow managers to monitor relationship quality in an efficient and objective way. The results suggest metrics to measure the soft factors of a relationship, such as trust and commitment. The market for outsourcing of IT services constantly grows with one of the major outsourced services being software development, often to emerging economies. Even though the benefits of outsourced software development can be an important incentive there still exist great risks especially for smaller businesses that generally do not obtain the necessary experiences to manage or even find an adequate provider. Thus, the objective of our study is to compile a holistic framework that covers all relevant aspects in the evaluation of a software provider in the context of outsourcing of software development. In order to reuse already proven evaluation concepts the paper identifies nine useful models for evaluating performance or service quality. Based on those, a dedicated model is developed which takes further practical factors in consideration. Through a survey with outsourcing experts the relative importance of the included dimensions and factors were determined. Solving complex tasks by collaborative teams is an important organizational capability. Beside traditional team work, an organization's collective intelligence can be supported by social software technologies. Within business process management (BPM), social software can be used to support the different lifecycle steps of a business process. In this paper, we introduce a framework which shows possible opportunities for social software to contribute to effective BPM. An expert workshop was conducted to receive a first evaluation of the framework. The combination of social software and BPM is supposed to improve the functional performance of IT systems for BPM and the employees' acceptance for BPM systems. Business Process Standardization (BPS) leads to significant changes in employees' working environment which affect acceptance for such initiatives. Organizational psychology and management research have examined the influence of work design on employee behavior (e.g., turnover). Based on that, we develop a model to analyze the impact of job characteristics, such as skill variety, autonomy, or task significance, on BPS acceptance. We surveyed employees of a non-profit organization during a process standardization initiative. As main contribution, this research shows that skill variety is the most important job characteristic for determining BPS acceptance. Business Process Standardization (BPS) leads to organizational changes, which are often faced with employee resistance. To make BPS initiatives successful, the 'human resource' has to be taken into consideration and with it, the job process fulfilled by them, their needs, and their work environment. The objective of this research is to analyze the role of employees affected by BPS initiatives and their perceptions of their work they are doing as part of the processes to be standardized. Based on job characteristics theory and the work-role fit concept, we develop a research model theorizing the role of these concepts for the acceptance of BPS initiatives. As main theoretical contribution, this research explains how employees' job-related attitudes toward their own work and the collaborations with others determine their (non-)openness towards BPS initiatives, while it will also guide managers in incorporating the 'right' people into a BPS project. A high level of shared understanding between business and IT is a critical success factor for effective IT usage in organizations. Hence, many studies in the Information Systems field have included shared business/IT understanding as a determinant in their research models. Most studies use a very compact instrument, measuring, typically, a one-dimensional construct that only addresses single facets of the overall concept. While most of these studies fulfill statistical validation requirements, content validity of the construct is seldom addressed. In this paper, we propose that more cognitive methods are needed to develop measures for complex constructs like shared understanding. The goal of our study is the development of a content validity proven survey instrument that measures the degree of shared business/IT understanding in a multi-faceted manner. In this paper, we adopt an innovative method of content validation by comparing survey results with data from a cognitive measurement approach (Repertory Grid Technique). We provide results from two studies: one experiment with students and a pilot field study with practitioners. After further refinements, the resulting instrument can support research on shared business/IT understanding and practitioners who aim at monitoring the relationship between business and IT units in their organizations. The mutual understanding, shared knowledge, or cognition between business and IT units has been discussed frequently and in wide range of fields in IS research. On the other hand, we are still lacking a consistent and comprehensive conceptualization of what shared business/IT understanding is actually about, and previous studies have usually only taken some aspects of it into account. These often single-dimensional determinations represent an incomplete picture of shared business/IT understanding and thus can potentially lead to wrong or incomplete findings and implications. This research in progress steps into this gap and develops a comprehensive construct of shared business/IT understanding to provide future research with a unified concept that can be applied to various IS research contexts. In this paper, we discuss current conceptualizations of shared business/IT understanding and integrate them to a unified multidimensional construct, which will be validated and adjusted in future empirical research. Researchers have acknowledged that shared understanding between business and IT is a crucial factor to achieve high performing teams, well aligned units, and superior business value of IT. In addition, they agree, that this determinant of social alignment is very complex and difficult to govern. However, a goal-oriented governance will only be possible if the target is clearly and adequate defined. In this paper, we will provide a structured review of the IS literature addressing the question how shared business/IT understanding has been conceptualized and used in the various fields of our research community. We identify strong differences between and within these research domains regarding the conceptualization. Primarily, we find that most of the papers just analyze single aspects of shared understanding but miss the "big picture". Our findings can point researchers to potential lacks of conceptualization of Business/IT Shared Understanding in their research domain and will help to cross borders among different research strands, which all will potentially profit from a more holistic and comprehensive investigation of shared business/IT understanding and its role for effective collaboration among business and IT. Business process standardization (BPS) has recently got into focus of the BPM literature as a methodology to substantially enable efficiency potentials and therefore improve process performance. So far, the BPS literature has exclusively focused on success factors for BPS and relevant capabilities. By contrast, inhibiting factors have not been sufficiently considered, yet, but success factors respectively enablers and inhibitors are not simply the opposites. The objective of this paper is to identify factors which inhibit BPS and to deduce management actions which help successfully standardize processes. To answer this question, we study the case of an international process standardization project in a global maintenance company. We derive a set of inhibiting factors for BPS. Thereby, some of these inhibitors have to be considered for any organizational change project while others are BPS specific. The specific inhibitors are analyzed in detail and discussed by mirroring them to non-BP standardization research. Firms are focusing more closely on standardizing or homogenizing instances of a particular business process across different business units or locations. Our paper introduces research in progress on a business process standardization (BPS) procedure model that guides firms in conducting effective BPS firm-wide. This model is currently being developed and tested by applying it to a business process at Lufthansa Technik, following a design science cycle and taking an action research approach. This paper shows how we are following the good-practice guidelines of design science and how we intend to evaluate the applicability and effectiveness of the model. Eventually, we expect this model to contribute significantly to extant research on BPS, which has to date focused on the outcomes of BPS and on the contingencies of BPS effectiveness rather than making prescriptive suggestions for reaping substantial process efficiency gains in large and decentralized firms. Innovation is important for a firm's success and has been shown to be essentially influenced by absorptive capacity (ACAP). ACAP has been conceptualized by various dimensions that, in turn, rest on diverse antecedents. Currently, little is known about the impact of information systems (IS) on these dimensions of ACAP. Drawing on the complementarity argument that IS will only render an effect if jointly employed with complementary organizational capabilities, we develop a research model that elucidates the interplay of organizational capabilities, ACAP, and their effect on innovation success. In particular, we deal with combinative capabilities by splitting these organizational capabilities into mechanisms and control modes. Addressing calls in the literature and from industry, this model contributes to our understanding of how to build and improve a firm's innovation capabilities by theorizing combinative capabilities and IS as antecedents of ACAP. Mobile devices and apps have changed the way consumers perceive and use IT. As mobile apps are easy to use and to procure, they have begun to enter the corporate world "under the radar" outside of the control of the IT unit. Employees bring their own mobile devices (BYOD) and apps to do their work - which raises various problems. As a counter-measure, firms have launched BYOD programs and set up Enterprise App Stores (EAS) where their employees can install certified and licensed apps under the firm's control. This paper aims to take a first step in scientifically exploring this new concept of EAS and exploratively develops a benefits framework which can serve as foundation for the conceptualization and empirical investigation of EAS value and adoption by future works. 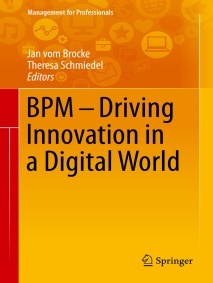 Standardization of business processes is considered as one of the most important instruments in the context of BPM. Research has mostly focused on the impact of business process standardization on business process performance while only a few attempts have been made to determine the success factors for effective process standardization, yet. However, a major issue in any standardization initiatives is to convince decision makers to follow the standard. This is particular true when it comes to process standardization: how can a firm be sure that its different divisions have implemented the process standard and that the employees adhere to the rules? In this paper, we propose a governance model that consists of a role concept for successful process standardization and provide first steps of evaluation through a qualitative case study with an international aviation company. In this paper, we examine challenges related with offshore outsourcing to Peru and their effect on relationship quality and outsourcing success. In three case studies, we interviewed clients and providers about their experiences with software development outsourcing from Anglo-American countries (U.S., Canada, Scotland) to Peru. We identified particular challenges which have at least a minor negative impact on relationship quality and outsourcing success, however, are manageable - the related management actions were extracted from the cases, as well. We argue that Peru becomes an interesting player in the global offshoring market and which particularities practitioners should be aware of when considering outsourcing to Peru. This paper explores the effect of management actions on social exchanges in outsourcing relationships. Social exchanges between individuals constitute relationship quality between client and vendor, which is an important factor of outsourcing success. Based on the interaction approach, we develop a framework for management actions entailing three dimensions: the exchange targeted, the organization targeted and the effect on social exchanges. We apply the framework to studying a comprehensive case of an outsourcing relationship full of conflict. This proof-of-concept shows that it is vital to consider side effects of management actions on social exchanges as they indirectly influence outsourcing success. Outsourcing relationship quality (ORQ) has shown to be an important construct in previous research on outsourcing effectiveness. But, while there are various works that have conceptualized and operationalized ORQ as a rich and multi-dimensional construct, other studies which consider ORQ as (usually mediating) component of their theoretical models make hardly use of those works but often use less rich constructs. The research on hand attempts bridging the gap between those two groups of works. A multi-dimensional ORQ construct is used to evaluate the relative importance of different ORQ dimensions, such as commitment, trust, etc., in regard to different dimensions of outsourcing success (overall satisfaction, goal achievement, service quality). For example, while many studies use trust as proxy for ORQ, our study shows that, depending on the outcome variable, other ORQ dimensions might be more relevant and should be used instead or additionally. Thus, the main contribution is identifying those ORQ dimensions which are most relevant regarding different outsourcing success variables. Future studies on outsourcing success factors will have a better ground to argue for or against using certain ORQ dimensions in their studies. Moreover, the study sensitizes managers for different distinct ORQ dimensions and their importance for a successful outsourcing relationship. Continuously innovating is known to provide firms with a competitive edge over rival firms. As innovations are often created in networks, a firm's partners exert an influence on the focal firm's innovative outcome. Although many studies deal with innovation networks and open innovation as a means to explore external knowledge and exploit knowledge externally e.g., dealing with characteristics of partnership agreements, there is virtually no research regarding characteristics of external partners. Namely, whether a focal firm's partners are innovative themselves and what the effects of this innovativeness on a focal firm's innovative outcome might be. This study considers different types of partners such as customers and suppliers and deals with the differential impact of partners` innovativeness on a focal firm's knowledge stock, absorptive capacity (ACAP), and innovation success. Drawing on literature on open innovation and ACAP and employing a survey in the manufacturing industry, we show whether a certain partner types' innovativeness is linked to innovation success, knowledge stock, and ACAP of a focal firm. E.g., we found that only the innovativeness of firms organized in clusters is positively and directly linked to innovation success, while customers' innovativeness influences positively and directly certain components of ACAP and knowledge stock. Knowledge can be seen as a key asset of a firm for coming up with innovations. Therefore the knowledge stock of a firm comprising different domains like market or technological knowledge builds the basis for innovating successfully. Accordingly, the use of knowledge management systems is of great importance for building and enhancing the knowledge stock. The paper analyses the effect of each knowledge domain on innovations success and what the role of knowledge management systems is about within this context. Using data from 225 firms the results show that the use of knowledge management systems influences each knowledge domain positively and that for innovation success technological as well as process knowledge plays the most important role. Thereby our research gives practical guidelines for investigating into specific knowledge domains for generating innovation success. Existing empirical research on the business value of Service-Oriented Architectures (SOA) has only measured the extent of SOA adoption - but not maturity - to determine whether typical goals, like increased business agility or IT cost reduction, could be achieved. However, a widely implemented SOA might be less mature than an SOA adopted only in particular areas of the organization, which in turn can lead to mismeasurement and misinterpretation. On the other side, the few existing SOA maturity frameworks that have been specified by previous researchers lack valid operationalizations to make them applicable to empirical research. Ready to use items and scales for evaluating the particular maturity level of an organization are missing. We propose to measure the degree of SOA maturity as a new variable for future empirical research especially in the context of SOA business value. Our analytical approach uses 21 items to classify the maturity of an organization's SOA in seven maturity levels along seven maturity dimensions derived from The Open Group Service Integration Maturity Model (OSIMM). The applicability of this new instrument is shown using data from 121 organizations. The results show that the majority of the organizations has only reached SOA maturity levels two to four. Also, higher levels of SOA maturity highly and significantly increase the realized business value from SOA in terms of business agility, straight through processing (STP), and reduced IT costs. However, the marginal benefits are decreasing for higher levels of SOA maturity in cases of STP and business agility. By extending the research on identifying the possible benefits of Service-Oriented Architectures (SOA), we investigate how SOA delivers its value in an organization. One perspective in the existing literature suggests that service orientation works through creating better IT/Business collaboration as the "services" concept is a shared mental model that reduces the mental gap between IT and business units. Another perspective proposes that SOA benefits require IT/Business collaboration in the first place as IT and business must closely collaborate in order to leverage SOA's potential. We develop a theoretical model to understand how service orientation and close collaboration between IT and business departments are related. An analysis using data from 122 organizations reveals that SOA does not advance - but rather requires - close collaboration between the IT and business departments (i.e., collaboration is a moderator, not mediator, between SOA and its impacts). Therefore, close IT/business collaboration is an important success factor for realizing SOA's value potential and must be established using other means. How can management handle relationship problems arising from cultural differences in multinational IT project teams? This paper uses a social capital lens to better understand the negative impact of cultural differences in IT project teams. In contrast to many previous works we do not consider cultural differences as a whole but explore the role of the different national culture dimensions. This allows for a more detailed view on cultural differences in a team context and thus contributes to a better understanding about which dimensions of national culture drive relationship problems and which management measures can help to dampen the negative effects. Based on several exploratory cases (6 multinational IT projects in 4 companies, headquartered in Germany), the authors identify three patterns showing typical problems in team social relationships which arise from differences in particular dimensions of national culture. Pattern-specific as well as general management measures, employed to address the culture-driven negative effects, are identified as well. Innovation is considered a major driving force for the prosperity of firms and entire economies. Research suggests that a firm's capacity to acquire and utilize relevant knowledge from internal and external sources, i.e. its absorptive capacity (ACAP), is decisive for innovation success. But what is the role of Knowledge Management Systems (KMS) for a firm's ACAP and innovativeness? Surprisingly, despite lots of mature research on both, ACAP and KMS, there is a gap linking the two. This paper hence asks: What is the effect of knowledge management systems usage on absorptive capacity and innovation success? Responding to recent findings in the management and organizational sciences we develop a theoretical model that links the availability and usage of KMS with a firm's ACAP and its organizational knowledge to explain innovation success. An empirical evaluation using data from 224 manufacturing firms shows that a firm's KMS strongly contributes to its ACAP and catalyzes the innovation process. The results suggest that organizational knowledge is important for innovation success and that successful KMS work through enhancing particular facets of ACAP. This paper presents an embedded exploratory case study of an application service provider's (ASP) client relationships. We focus on the relationship between the vendor and the clients in the ongoing business, which we analyzed based on interviews with client representatives, a pre-interview questionnaire assessing goal achievement, service quality, and relationship quality, and an identification of the real-life social network structure between vendor and client staff (not to be confused with online social networks). We identified two categories of clients fundamentally differing in their expectations for ASP support, which influences the formation of the social network structure between both firms. We found that ASPs should be aware of client differences and differentiate their support services accordingly in order to satisfy their clients in the long run. As main contribution, we extend the Expectation Confirmation Theory by adding a social network-theoretic argument explaining why disconfirmation does not necessarily reduce satisfaction in B2B relationships. Sowohl die jüngere Forschung als auch die Erfahrung von Praktikern postulieren, dass eine SOA-Governance kritisch für eine erfolgreiche Implementierung von serviceorientierten Architekturen (SOA) ist. 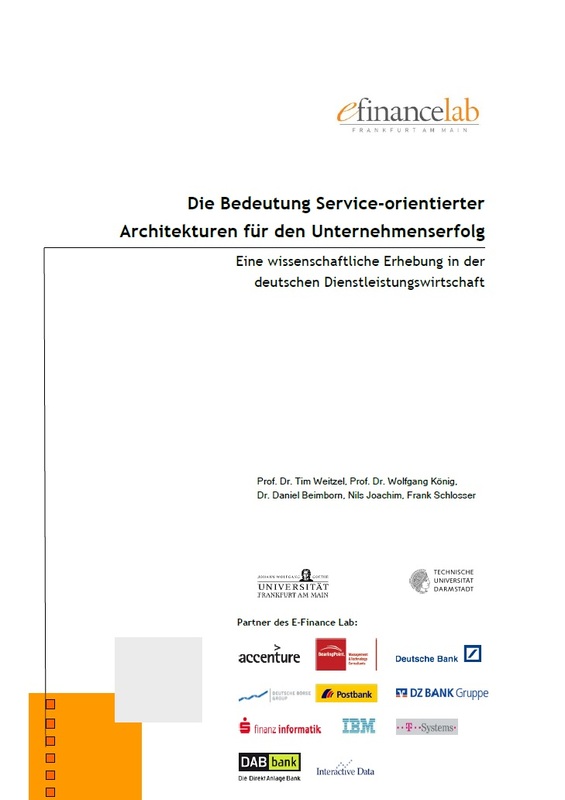 Dieser Beitrag bietet eine der ersten empirischen Untersuchungen bezüglich der Bedeutung verschiedener SOA-Governance-Mechanismen (Schaffung von Entscheidungsstrukturen, Nutzung von Standards, Verwendung von Servicemanagement- und Serviceentwicklungsprozessen, Qualifikation von Mit-arbeitern und Zusammenarbeit von Fachbereichen) für das Erreichen der gewünschten Modularität und einer hohen Wiederverwendungsrate. Die Ergebnisse basieren auf einer Umfrage unter deutschen Dienstleistungsunternehmen und zeigen, dass eine höhere Wiederverwendung nicht nur direkt durch verschiedene SOA-Governance-Mechanismen, sondern vor allem auch durch eine geeignetere Modularität als Mediator erreicht wird. Außerdem ist die Verwendung bestehender Entscheidungsstrukturen gegenüber der Schaffung neuer Entscheidungsstrukturen in Bezug auf die Erreichung von Modularität und Wiederverwendung zu favorisieren. Zuletzt wird ein starker Einfluss der Verwendung von Standards und klar definierter Servicemanagementprozesse auf die Effektivität von SOA deutlich. Bisher wurde der Wertbeitrag der Nutzung von serviceorientierten Architekturen (SOA) für Unternehmen weder in der Praxis noch in der Forschung jenseits von Einzelfallbetrachtungen nachgewiesen. Wir untersuchen in einer ersten quantitativen Studie die realisierten Vorteile einer SOA-Nutzung im Hinblick auf Kostenreduktion, unternehmerische Agilität, Datenqualität, Prozess-Monitoring, interne Geschäftsprozessintegration (STP) und unternehmensübergreifende Integration (B2B). Die Analyse von 134 Unternehmensantworten zeigt, dass SOA zu allen sechs Unternehmensvorteilen beiträgt. Außerdem ist erkennbar, dass sich SOA in klassischen Aspekten flexibler IT-Infrastrukturen wie Modularität, Flexibilität und Skalierbarkeit widerspiegelt. Und auch die Realisierung von Unternehmensvorteilen durch SOA kann zu bedeutenden Teilen über die Verbesserung der IT-Flexibilität als Mediator erklärt werden. Diese Arbeit untersucht die Auswirkung von operativem ITBusiness-Alignment sowie insbesondere der Gestaltung der Beziehungsschnittstelle zwischen verschiedenen Fachbereichen auf die Nutzungsintensität von Informationssystemen sowie auf die Geschäftsprozessleistung. Wir entwickeln ein theoretisches Modell unter Anwendung einer sozialen Perspektive auf Alignment und auf die Beziehungsschnittstelle und evaluieren es anhand einer Studie der IT-Nutzung im Firmenkreditprozess US-amerikanischer Banken. Die Ergebnisse zeigen, dass die Qualität der Beziehungsschnittstelle zwischen verschiedenen Fachbereichen einerseits und zwischen IT-Einheit und Fachbereichen (gemessen in Form von Vertrauen, gemeinsames Wissen und struktureller Interaktion) andererseits erhebliche Auswirkungen auf die Nutzung der Informationssysteme im Kreditprozess und darüber auf die Leistung des Kreditprozesses haben. Insbesondere der Zusammenhang im Dreieck operatives Alignment, Beziehungsschnittstelle zwischen Fachbereichen und Nutzung von Informationssystemen liefert einen neuen Beitrag zu unserem Verständnis des Geschäftswertbeitrages der IT. To innovate is one of the basic functions of a firm and a competitive necessity in dynamic markets. So what management mechanisms can a firm use to foster innovation success? This paper analyzes if knowledge management (KM) and innovation governance (IG) distinguish top innovation performers. Theoretically, we scrutinize if KM and IG mechanisms, composed of systems capabilities (organizational structures, policies, and processes) and coordination capabilities, are antecedents of absorptive capacity, knowledge stock and, eventually, innovation success of a firm. Using data from 204 firms, the results show that (1) IG and KM applying firms have significantly higher innovation success resulting from higher absorptive capacity and greater knowledge stock, (2) the most important IG mechanisms are measuring innovation success, using tools for monitoring the innovation process and a structured idea management, (3) KM drives innovation generation but not its transfer to products and markets. The social network structure at the interface between a firm's business and IT units is of vital importance to business/IT alignment and hence an important IT governance object. Yet, there is a substantial gap in understanding the nature of these social structures and how they affect IT business value. Based on a literature review that comprises articles published in eight top IS journals since 2000, this paper identifies social network structure characteristics which represent antecedents of alignment. These are subsequently translated into precise concepts of social network analysis (SNA). The identification and formalization of such social network structures allow IT governance to implement social engineering mechanisms in order to influence the social network structure and thus business/IT alignment and IT value. Examples for such translated arguments are a high degree centrality of CIOs vis-à-vis other executives and strong ties in terms of cross-domain knowledge between the CIO and other executives. Recent research results and practitioner experience both posit that Service-Oriented Architecture (SOA) governance is critical to successfully implement and utilize SOA. We investigate the impact of different SOA governance and management mechanisms (structures, processes, and employees) for leveraging SOA's potential to increase an organization's IT infrastructure flexibility. The results based on data from 73 SOA using organizations reveal: (1) a negative impact of implementing new decision-making bodies on 2 dimensions of IT flexibility (IT modularity and integration) (2) a positive impact of the SOA management processes service management and service development on 2 dimensions of IT flexibility (modularity and integration of IT infrastructure) (3) a positive impact of business units collaboratively identifying jointly utilizable services on modularity (4) and a particularly strong impact of standards, and also of employee qualification, on all dimensions of IT infrastructure flexibility. Motivated by the importance of business/IT alignment for IT value creation and the fact that despite an extensive stream of literature discussing drivers of and success factors for alignment, the problem of reaching business/IT alignment is still not fully solved and alignment still ranks among the top three concerns of CIOs, we strive to explain alignment success based on the social structures present at the interface of business and IT on an operational level. While such structures at top management level are prominently discussed success factors of alignment, the analogues structures on the operational level have rarely been analyzed and there is a substantial gap in understanding the nature of these social structures and how they affect IT business value. We extend our prior research, which identified social patterns that are potentially beneficial for business/IT alignment, by adding detailed explanations of why these are beneficial for business/IT alignment. Hence, this paper contributes to existing research by providing new insights to the general assumption that social structures are important and by explaining why, despite the vivid discussion, still many firms fail to establish business/IT alignment. We find that strong bridges at the interface between business and IT, as well as strong connections of interface actors with their management and their unit are advantageous for the creation of IT/business knowledge, solidarity between IT and business and the power of the interface actors between IT and business, and in this way are beneficial for business/IT alignment. IT management increasingly involves teams dispersed throughout a globalized world in internal as well as outsourced projects. In this work, we focus on the latter and analyze the impact of social network structures between vendor and client team members on project success. We present the findings of a comprehensive literature analysis and give an outlook on the ongoing empirical investigation. The goal is to propose a model linking structural properties of social networks to dimensions of success of outsourced IT projects. We base this model on indications found in prior research and the results of explorative case studies in outsourcing arrangements. Our findings so far show that the network density at the client-vendor interface and the multiplexity of ties are the salient, but not sole, network properties for which existing research implies an influence on success of outsourced IT projects. Case studies will reveal how and why these and other social network properties have an impact on project success. Our research contributes to the quest for management action items that drive outsourcing management success. We hypothesize and empirically show that a certain piece of IT governance, the explicit documentation of roles and responsibilities of staff residing in the client firm's retained organization contributes to social alignment in terms of interaction quality, shared knowledge, and trust between the client firm's business and side and the outsourcing vendor. Our model is quantitatively tested by using data from 171 IT outsourcing arrangements in the German banking industry. We show that the documentation of tasks and responsibilities affects the service quality delivered by the vendor in terms of reliability and responsiveness, and that this impact is fully mediated by both client-internal social alignment and vendor/client alignment. This result represents a piece for helping practitioners to develop a better understanding of how to design their outsourcing governance to maintain and improve ongoing outsourcing relationships. To what extent are structural assumptions veiled in extant outsourcing research? In this paper we suggest a unified view on social ties between individuals in outsourcing relationships. In a comprehensive literature analysis of outsourcing research since 2001, we identified structural assumptions and categorize them based on social network measures. Our analysis uncovers two salient patterns: 1) The gatekeeper vs. high density trade-off in interaction between client and vendor employees, and 2) the question whether the strength of ties between individuals can be too high for a professional outsourcing relationship. We present these patterns and other social network structures to formalize assumptions mostly not explicated yet considered important in existing outsourcing research. Based on our results, further research should analyze the impact of these patterns of social structure on outsourcing success. In this paper, we explore the basic premise that IT service quality follows the structure of business/IT interactions and thus highlight an important organizational design issue in IT governance. Motivated by concepts used in social network theory we build a model that proposes a causal relationship between structural characteristics of social business/IT networks and IT service quality. 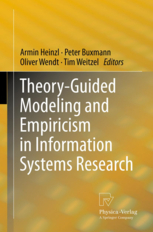 The model is empirically evaluated and explained using case studies based on five interviews in three firms. Thus we extend the general assumption that the business/IT partnership is crucial for IT service quality by identifying structural characteristics of the network among and between business and IT staff which enhance this partnership. Important results are that strong and bridging ties at the business/IT interface are crucial for IT service quality and that a good integration of interface actors within their own unit supports IT service quality. Innovativeness has emerged as a firm's key nonfinancial goal and as an important measure of organizational performance. But, the different measurement models used in empirical research impede the emergence of a consistent perspective on drivers and consequences of innovativeness. We reviewed 12 major journals from various disciplines and found 56 articles that provide measurement models for innovativeness. Based on reviewing and comparing these measurement models, we derive suggestions for a more comprehensive measure of innovativeness for future research. Which nearshoring risks arise from cultural differences between German outsourcers and IT providers located in the nearshore environment? This paper focuses on the domain of IT nearshoring which is quite sparsely researched. Based on exploratory expert interviews from the IT service industry in six typical nearshoring countries from a German perspective (Bulgaria, Russia, Serbia, Lebanon, Tunisia, Turkey), we analyze which and how cultural differences influence typical outsourcing risks. We develop a causal model which derives outsourcing risk factors (such as insufficient formal communication, insufficient interaction, emotionally laden communication, and insufficiently open communication) from different cultural dimensions and links them to traditional outsourcing risk dimensions. What are the determinants of an organization's decision to adopt Service-Oriented Architecture (SOA)? Although the paradigms of service orientation and SOA have become quite omnipresent in the IS literature, research is still lacking to provide a comprehensive view upon drivers and inhibitors of the organizational decision to adopt SOA. Based on the mature strand of adoption research, this paper develops a conceptual model in order to increase the understanding of the determinants influencing this decision. Thereby, the drivers and inhibitors are distinguished in organization-specific and innovation-specific factors. The organization-specific factors cover two aspects: (1) the compatibility of technology and organization (i.e., SOA expertise of the employees, management support for SOA, IT/ Business alignment, degree of process documentation) and (2) management fad and fashion. The innovation-specific factors cover the perceived benefits, perceived complexity, and standardization of available technologies related to SOA. Beside developing this theoretical model for laying the foundation for future empirical research, a further contribution of this paper is the development of a comprehensive measurement model for SOA adoption, which differentiates between the IT and the enterprise layer. How does the availability of an SOA within a firm affect the potential of and intention for outsourcing business activities? Since one of the promises of SOA is to modularize the IT representation of business processes, it should facilitate business process outsourcing in terms of buying the provision of single business functionalities. In this paper, we develop a conceptual research model that theorizes the relationship between SOA and BPO intention. This paper focuses on the domain of IT nearshoring which is quite sparsely researched compared with IT offshoring or IT outsourcing in general. We conducted eleven exploratory expert interviews from the IT service industry in six typical nearshoring countries from a German perspective (Bulgaria, Russia, Serbia, Lebanon, Tunisia, Turkey) and in a German consulting firm being specialized in advising German client companies that intend to outsource IT related activities to vendors in nearby countries. Based on these interviews, we analyze which and how cultural differences between client and vendor influence typical outsourcing risks. We develop a causal model which derives outsourcing risk factors (such as insufficient communication, management, and cooperation) from different dimensions of national culture and links them to traditional outsourcing risk dimensions. This is a research in progress as more interviews, especially on the client side, will follow. Cross-cultural research in IT adoption has so far most often concentrated on disparities in IT adoption between countries with highly different culture profiles. Instead, we argue that there are also differences between cultural closely related countries (which, e.g., are geographically close and share the same language) which need to be understood. The question raises whether the dimensions of culture applied in prior literature to analyze IT adoption in highly distinct cultures are sufficient for explaining the differences in a close culture context as well or whether a more differentiated model of cultural dimensions has to be drawn. Based on indicative results from a three-country comparison within Central Europe, we find substantial differences in adoption drivers (Perceived Usefulness, Perceived Ease of Use) which seem to be impacted by "microcultural" disparities. As a consequence, we develop a conceptual model based on human values and cross-national differences in IT adoption which will allow us to analyze and explain these differences in future research. What is the role of control in maintaining trust in outsourcing relationships? Although the literature is quite rich on conceptualizing the relationship between control and trust in inter-organizational relationships, there exist quite sparse quantitative works which help to evaluate the models developed. In this paper, we analyze data from 156 IT outsourcing relationships of German banks in order to get insights into the actual relationships between different modes of control and the level of relational trust in these relationships. Additionally, we examine the role of service quality (measured in terms of reliability and responsiveness) in this context. The results show that trust is positively related with most modes of control, and that there is indicative evidence that control supports trust in high-service quality situations while it leads to a reduction of trust in relationships suffering from bad service quality (cycle of trust vs. distrust). What is the role of a firm's internal social relations between business departments and IT unit for the success of its IT outsourcing relationship? In this paper, we propose that the relationship between business and IT of a firm is crucial for achieving effective outsourcing management and for enabling the vendor to deliver the services as demanded. Since the business side of the client firm represents the users of the information systems but the IT unit represents the interface to the outsourcing vendor firm, interaction between both units is proposed to be required for maintaining a good outsourcing relationship. Based on a survey in the German Banking Industry and by adopting a Social Network Analysis Approach which captures the interaction structure within the client firm and thus represents an innovative scale to outsourcing research, we show that tight social linkages within the client firm lead to higher service quality achieved by the vendor firm. What is the interplay between IT/Business alignment and Service-oriented Architecture (SOA) regarding the achievement of business value in terms of business flexibility? This paper introduces a conceptual model that derives propositions about how IT/Business alignment, IT flexibility, and business flexibility are interrelated and how SOA and alignment interact in order to increase business flexibility. We apply and integrate well-known multi-dimensional concepts of both IT/Business alignment (in terms of strategic alignment, structural alignment, and social alignment) and IT flexibility (technical and non-technical IT flexibility) and map the conceptual components of SOA (architectural and the governance dimension) to this resulting model. This conceptualization will allow for more profoundly structured research on how SOA contributes to business value. This paper argues that business process standardization, as part of BPM activities, is an effective way to improve business process flexibility and performance. We develop and empirically evaluate a theoretical model of the differential impact of business process homogenization and optimization on business process flexibility and performance. The analysis based on data from 85 large firms shows a strong and highly significant influence of process standardization on business process flexibility and performance. This paper is among the first to propose a research model and empirical operationalization to analyze the twofold impact of process standardization on business process flexibility and performance. For practitioners the paper provides actionable recommendations on how to apply the findings to their management context. What is the impact of a Service-oriented Architecture (SOA) on the efficiency and effectiveness of business process standardization (BPS)? The contribution of this paper is the development of a research model around the impact of SOA on BPS in terms of achieving fundamental efficiency and flexibility potentials while covering both the business layer and the IT layer of the firm. Drawing on an accepted and widespread enterprise architecture model, we derive propositions that explain why and how SOA's characteristics help to standardize business processes and how the interplay between SOA and BPS leads to an increased overall business value. Additional moderator arguments, such as the level of service granularity, the centrality of SOA governance, or Business IT alignment, are added to the research model as critical success factors of achieving business value of SOA. We empirically investigate the interplay and impact of process standardization and IT intensity on business process performance in terms of efficiency, quality, control, and processing time. To this aim we surveyed the retail advisory operations of Germany's largest banks. We find that standardization enhances efficiency, quality and control of the advisory process. Additionally, IT intensity on its own shows positive effects on efficiency and quality as well, while it leads to more customer facing time needed for a single customer. Also, the interaction effect with process standardization is relevant. We conclude that IT creates business value through facilitating process standardization and process control. Our results strongly indicate that managers have to look carefully at the type of the processes before standardizing it. Our research intends to explore whether a social perspective on IT business alignment can help shed light on the IT value creation process by considering different facets of interpersonal linkage. In this paper, we develop a theoretical model which could be discussed at the JAIS workshop. Further, we use some empirical data from 149 US banks in order to find first empirical evidence whether our research focus represents a promising direction. We find initial support for our main hypotheses that communication, cross-domain knowledge and mutuality among and between IT and business staff significantly impact IT usage and business process outcomes. The final results of our research could contribute to our understanding of how the IT resource should be understood and used to measurably contribute to firm goals. The initial findings support the caveat of recent studies suggesting that informal aspects of alignment might be quite notable (e.g. Chan, 2002) and show that our theoretical understanding of alignment should be extended to better incorporate social aspects of daily work life. The way cultural values affect the adoption of information technology is an important field of research within the area of Information Systems. Up to now, much research work has been done to explain differences in IT Usage between totally different cultural regions. By contrast, in this paper we discover significant differences regarding the usage of information technology respectively the Internet in HR marketing between the German speaking and culturally rather close countries Austria, Switzerland, and Germany within a survey among the 1,000 largest companies in the particular countries. The paper in hand develops a theoretical model to analyze these differences and outlines our plans for empirical research pursuing the objective to scrutinize and explain the ascertained differences in IT Usage between the mentioned countries. What is the business value of Service-Oriented Architectures (SOA) and how can we achieve it? This paper represents a conceptual piece of research which focuses on the impact of IT Business Alignment (ITBA) on the successful implementation of SOA, in terms of its business value. The contribution of this model is predominant in proposing a threefold effect of ITBA on achieving a successful implementation of SOA through the specific strategic needs defined by a particular firm in a specific industry, i.e., the banking industry. As a result, we show that the business strategy moderates the impact of SOA?s general potentials on its actual business value and claim that this relationship is further moderated by ITBA, which must be thoroughly considered by practitioners deciding on introducing SOA in their firm. Although many firms have started or accomplished to migrate their IT infrastructure towards a ser-vice-oriented architecture (SOA), as flexible and adaptive fundament of their business applications, there is still a gap answering one of the most essential questions associated with this new architecture para-digm: What is the business value of SOA and how can we influence it? What is the business value of Service Oriented Architecture? Although the SOA paradigm has become quite evident in IS literature, a comprehensive model of the SOA business value is still lacking. Based on a literature review and on a multitheoretical foundation, drawing on the adoption of innovations literature and on the resource-based view as well as on resource dependency theory, we attempt to develop a research model which captures the business value of SOA, applicable to empirical research in subsequent studies. Expectations about stand-alone and network benefits determine the adoption decision of customers and hence the diffusion of standards. To increase the number of adopters of a communication standard like EDI, not only the ability to exchange messages (as a source of direct network effects), but also the provision of complementary services such as standardized master data, e.g., by establishing a central, industry-wide EDI data pool (as a source of indirect net-work effects) is important. We thus examine the differing impact of direct and indirect network effects on the adoption and diffusion of communication standards. The incorporation of both network benefits into an agent-based simulation model may help to better understand the underlying diffusion problem. How can relationship quality in outsourcing partnerships be achieved, sustained, and improved? In this paper we present a conceptual model that focuses on the identification of the relevant determinants for a successful IT outsourcing relationship as well as on the operationalization IT outsourcing relationship quality. We contribute to existing relationship literature by thoroughly examining existing constructs and, if applicable, spliting and redistributing them. We also consider additional relationship quality dimensions and determinants. The derived eleven dimensions and fifteen determinants are empirically validated in a subsequent three step empirical approach providing a much more detailed and throroughly structured relationship quality model which will eventually help practitioners in improving their crossorganizational IT-business relationships. This paper presents a framework assisting managers in their decision making about introducing a service-oriented architecture (SOA). The benefits, risks and efforts associated with SOA are discussed from a business value perspective. The paper contributes to the literature by suggesting a unified foundation for the debate on the business value of SOA by proposing concrete value drivers and their interrelations. Alignment and IT flexibility have been found to be crucial for a firm's long-term success in many indus-tries. This paper investigates how alignment and flexibility are interrelated at an operational level. Based on a survey with Germany's Top 1,000 banks we show on a business process level that shared knowledge and mutual understanding (as dimensions of alignment) between IT unit and business department have a positive impact on IT flexibility. On the other hand, higher degrees of communication between business and IT units do not correlate with higher IT flexibility. The literature has shown that relationship management between and within different entities is crucial in manifold contexts. The prominent IS research strands of IT business alignment and outsourcing relationships tackle this topic from different perspectives. We argue that there are strong overlaps of these concepts and claim for a consolidation of both research strands. We match both research stream´s measurement constructs, show the overlap as well as the remainder and propose a unified model. This model consists of six dimensions and allows for a combined measurement of relationships between business and IT units within as well as across organizational boundaries. The academic sector has been faced with strong monopolization tendencies occurring in the academic publisher market in recent years. A countermeasure from the demand-side has been the formation of procurement consortia by academic libraries which are intended to reduce costs and simultaneously optimizing the availability of academic journals in order to sufficiently serve their customers (i.e. faculty and students). The objective of this paper is to determine cost-minimal structures for library consortia. We develop a non-linear and binary optimization model which is solved by applying a genetic algorithm (GA). The paper demonstrates the effectiveness of the GA by applying it to a real-world problem in the German academic e-journals market. The results show that the found solution results in costs that are approximately 30 % lower than the current regional-based solution. The literature suggests that the success of an information system among others depends on its utilization. In this paper, we argue that operational IT business alignment is an important driver of system usage and thereby of the market success of the supported business process. Using an embedded case study in four branches, the back office, and the IT department of a retail bank, many findings of the recent alignment literature can be supported. Using a strict business process perspective, we also offer new insights by showing that alignment is important for IS success in operations as well and positively influences post-implementation IS usage. In particular, mutual understanding between the units and shared domain knowledge not only between IT and business but also between different business units supported by the same core IS turned out to be very important factors of IS usage that have so far been neglected. This paper provides exploratory findings of an empirical survey accompanied by a series of case studies that motivates research in e-Business largely neglected before, namely the lateral cooperation of firms from two different industries that interconnect their business processes by means of electronic integration. The integration of financial processes in non-banks and financial service providers. We identified empirical evidence for a large potential of value chain crossing but also found substantial inhibitors for the adoption of this idea. Starting from those findings, we outline a research program to tackle this promising area of e-Business research in future. 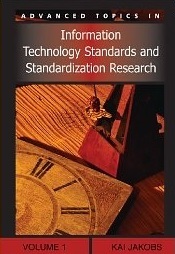 IT standards are subject to network effects which establish challenges concerning a successful diffusion of standards. A renowned example is a mobile service provider trying to establish a network of customers while potential user often wait until the network is sufficiently large in terms of other users (direct network effect) or content available (indirect effect). Despite the potential benefits to adopters and providers, there is still much uncertainty on the differential impact of direct and indirect network effects on the diffusion of standards and their impact on successful diffusion strategies to establish a user base. Our research questions thus are: (a) ...what are the adoption drivers of IT standards and (b) ...how can providers influence these drivers to develop an installed base? Based on network effect theory, we propose a formal model that simultaneously considers the different effects of direct and indirect network effects on the diffusion of communication standards. Using com-puter-based simulations we can show that IT providers could exploit the alternating impact of direct and indirect network effects at different diffusion stages to successfully establish an installed base. This has fundamental implications for the provider's pricing and market strategy. A possible trend in outsourcing, cooperative sourcing is the merging of similar processes by several firms. For example, several banks could merge their payments processes and the underlying IT to jointly realize economies of scale. But what are conditions of stable outsourcing coalitions? And how to allocate costs within the outsourcing value web? In this paper we present a micro economic model for analyzing cooperative sourcing decisions. Using a game-theoretical equilibrium analysis, distribution rules of cooperative sourcing benefits are evaluated and necessary condition for stable sourcing cooperations are identified. We formally prove that only a proportional allocation of costs will regularly lead to stable coalitions. Still, a game theoretic experiment indicates that deciders not knowing about the results are more likely to choose inefficient allocations leading to instable sourcing networks. What will be efficient sourcing constellations in the competitive banking market which force banks to optimize their processes and to change organizational structures? 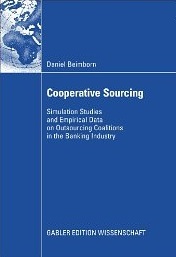 This paper presents a model for investigating causes and effects of Cooperative Sourcing in the banking industry. Cooperative Sourcing means merging of similar processes by several firms, such as several banks merge their credit handling as well as the underlying IT, to achieve economies of scale. The model is able to capture these IS-based factors and to analyze the efficiency of sourcing decisions and rsulting market constellations.Due to the complexity of the involved factors, a simulation approach is used for applying the model. Fed with appropriate data the model could support BPO decisions based on analytical analyses as well as on simulation-based compound investigations. What are future requirements for ERP solutions for SMEs? The following research paper focuses on identifying possible new interfacial areas between banks and SMEs. New banking services could be embedded into SMEs' information systems to support their financial processes such as cash management, reconciliation, customer management and asset management. We develop a framework and a methodology for our empirical explorative research. They are intended to be the foundation for investigating both, financial processes within SMEs, as well as firms' willingness to adopt new services offered by financial service providers. Furthermore, first results from four case studies indicate some promising results. They also show particular problems from granting a bank access to SME-internal systems. Economies of scale, scope, and skill are known to be major drivers or inhibitors for outsourcing business processes. 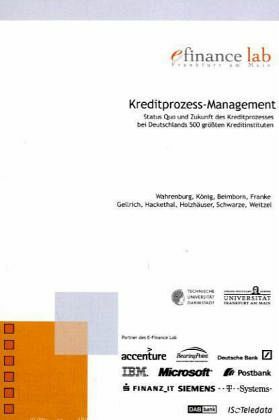 This paper presents a comparative analysis of economies of scale, scope, and skill achievable by outsourcing financial processes in non-banks and banks based on two empirical studies conducted with Fortune 1,000 non-banks and Fortune 500 banks in Germany. It can be shown that industrialization tendencies within the credit business in banks are in parts broader sophisticated than within financial processes of other industries. Credit process managers estimate economies of scale and skill achievable by outsourcing to be higher than chief financial officers do. Furthermore, economies of scope, which inhibit selective sourcing, are evaluated as being less problematic. As a result, the credit process managers' disposition to outsource (parts of) primary financial processes in banks is higher compared to the CFOs' attendance to outsource parts of their secondary financial processes in non-banks. In accordance with common knowledge, economies of scale and skill are identified as drivers for outsourcing business processes while economies of scope represent an inhibitor. In contrast to common knowledge, our studies suggest German banks being on the way to industrialization and modularization. Während viele Unternehmen Fortschritte in der IuK-Technologie zur Automatisierung ihrer primären Prozesse, zu einer internen und externen Vernetzung und letztlich zur Neuaufteilung und Optimierung der gesamten Wertschöpfungskette genutzt haben, wurden Sekundärprozesse selten als eigener Optimierungsgegenstand betrachtet. In einer empirischen Studie zu sekundären Finanzprozessen in den 1.000 größten deutschen Unternehmen (ohne Banken und Versicherungen) wird gezeigt, dass vor einer Outsourcing-Entscheidung kulturelle Hürden der Entscheider zu überwinden sind. Es zeigt sich insbesondere, dass die individuelle Outsourcing-Erfahrung der entscheidenden Manager von Bedeutung ist und dass Economies of Scale und Scope getrennt betrachtet und damit mögliche Trade-offs häufig ignoriert werden. 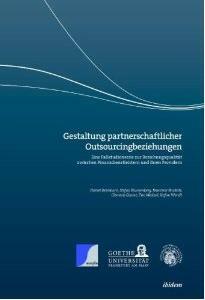 Zur Erweiterung der reinen Outsourcing-Entscheidung im Hinblick auf viel versprechende Modelle des kooperativen Outsourcing wird untersucht, wer geeignete Partner für eine selektive Auslagerung von Teilprozessen durch eine Kreuzung der eigenen Wertschöpfungskette mit derjenigen des Partners (Value Chain Crossing) sein können. Aufbauend auf diesen empirischen Ergebnissen wird ein Simulationsmodell vorgestellt, welches insbesondere die simultane Betrachtung verschiedener Einflussfaktoren der Outsourcing-Entscheidung erlaubt. In recent years, increasing monopolization tendencies in the market for electronic information resources in the academic sector have led to the formation of consortia by university libraries and other academic institutions, which are intended to act as an antipole to increase their bargaining power against the monopolistic structures of the publisher market. The aim of this research paper is the development of a model that determines minimal-cost structures for buying consortia in the context of academic libraries. Two different points of view are discussed: on the one hand the optimal choice of the pricing model for purchasing electronic journals and on the other hand the optimization of consortia structures for bundling bargaining power. For the first part of the framework a break-even based approach is developed and applied to empirical data. It can be shown, that German academic libraries can cut their procurement costs by canceling subscriptions and switching to pay per view by about 30%. The second topic - the consortia structure problem - is solved by a binary non-linear optimization model, which also is applied to a real situation. In future it is able to determine, for example, the optimality of a Germany-wide library consortium and to show efficient alternatives. While many firms have used advancement in information and communication technology to optimize their supply chain and primary processes, there is still a substantial efficiency potential associated with financial processes. In this paper, a conceptual framework for a systematic financial chain management is developed. Based on this, an empirical survey with the Fortune 1,000 enterprises of Germany shows that while outsourcing of the financial chain is still quite rare it can be successfully used to focus on core competencies. A main finding is that CFOs tend to systematically overestimate the quality of their financial processes and especially the firm's competencies compared to external experts. This is an important cultural barrier to a value redesign that could offer substantial efficiency improvements. Usually, patent protection is awarded only to technical inventions such as light bulbs, shavers and pharmaceuticals. After computer programming became viable, and protection of computer programs became desirable, most countries decided that software was too abstract or intangible to be patentable, and copyright be-came the dominant form of protection. Nowadays software patents are a widely discussed topic in the U.S. and in Europe because of their proposed impact on na-tional innovation rates. Based on an analysis of the determinants of successfully developing software, we developed a bipartite probability model for comparing a deregulated market without patents to a market using a patent system. Using computer-based simula-tions, we compare different scenarios to test the impact of different patent dura-tion and width on the innovation behaviour of the software market. We can show that that strong patent protection is globally efficient only in markets with a rela-tively low profit potential. The problems which knowledge workers face these days are very dynamic, unstructured, highly complex, and often cannot be fully explicated. Such problems of 'moving targets' require different problem solving capabilities by the actors. Because abstract information is less valuable in these environments, knowledge workers have to utilize other channels than 'hand-books'. Hence, corporate knowledge networks again are on top of the research-agenda. For the knowledge worker not the access to large databases but the access to knowledgeable colleagues becomes the important factor. In such networks the question arises, which managerial actions are appropriate for successful community-development, i.e. supporting the actors. Unfortunately, today's practices of commu-nity-engineering are often characterized by gross simplifications and strong technological focus rather than modeling the impact of managerial actions before taking them. As part of a larger research-project, this paper addresses topological structures as action vari-able of community-engineering. A computer-based simulation model is introduced and applied to real-life data from over 800 students and staff of the Economics and Business Administration Department at Frankfurt University, Germany. Virtual informal communication networks are widely recognized as an important part of corporate knowledge management (KM). Unfortunately, most practices of community-engineering are characterized by intuitive actions from KM managers rather than systematic network development based on detailed analysis. Therefore, as part of a larger research framework, this paper addresses topological structures as action variable of community-engineering. A dynamic computer-based simulation model is introduced and applied to real-life data from over 800 students and staff of the Economics and Business Administration Department at Frankfurt University, Germany. Several metrics of networks performance are developed and illustrated using different exemplary actions of community-engineering. In this paper, an analogy between IT firm valuation and IS valuation is used to learn from how investment banking professionals cope with the renowned valuation problem. It becomes clear that theoretically sound approaches like the discounted cash flow might be inappropriate to determine the true value of a software company. Especially for IT valuation, real options approaches are a promising way of capturing the &rdquo;true&ldquo; underlying value to new technologies. Unfortunately, as expert interviews reveal, the importance of this approach in investment banking practice is negligible. Patente auf Software - gibt es eine optimale Schutzweite? The issue of software patents is widely discussed in Europe today. The standard economic rationale for patents is to protect potential innovators from imitation, which ultimately provides the incentive to incur the costs of innovation. This incentive topic is strongly discussed in network effect markets such as the software market. We identified five characteristics of software which are crucial for the question of patenting and its consequences: Sequentiality, complementarity, the utilization and availability of open code and the necessity to ensure interoperability as well as the digital character of the goods. Based on seven assumptions affiliated from the literature, we developed a bipartite central probability model comparing a deregulated market without patents to a market using the patent system. The main objectives were to evaluate the frequency of innovations in the software market and on the other hand to investigate monopolistic tendencies. We simulated our model under two different parameter constellations (optimistic and pessimistic environment from a patent owner's view). Selected snapshots of exemplary simulations showed that strong patent protection circumvented technical progress from a macroeconomic perspective. Moreover, in the long run only one actor (monopolist) dominated the market. Reducing the protection strength (pessimistic environment) resulted in partially contrary effects. Networks utilizing modern communication technologies can offer competitive advantages to those using them wisely (e.g. enterprises). Besides technical and organizational issues there are prob-lems concerning planning and operating networks due to an asymmetry of costs and benefits among the network agents making the development of internalization strategies difficult. Goal of this paper is to systematically identify the strategic decision situation of individual agents as a foundation for cooperation strategies aimed at exploiting network benefits. A systematic analysis of decision errors of agents in networks using computer-based simulations reveals principal solution scenarios and shows that network cooperation problems might frequently be not as difficult to resolve as often feared using comparatively simple strategies. The diffusion of innovations has long been a research domain in IS research. Yet, there is no sound theory nor practice to fully understand the complex mechanisms behind networks of users who are tied together by compatibility requirements as is frequently witnessed in information and communication networks. The goal of this paper is to identify key determinants of the technology battle between WAP and i-mode that is recently raging between German cellular service providers and to propose a possible diffusion path. By adapting an existing network model of technology diffusion, key influences are identified and incorporated into a computer-based simulation model. In doing so, trade-offs like better presentation quality on i-mode cellular clients vs. higher service costs compared to WAP applications can be modeled to propose a systematic sensitivity analysis of factors influencing the success of the respective mobile technologies and associated services. Not at least, the simulation model supports mobile services providers to customize their prices for a faster market penetration through regarding not only indirect (WAP, i-mode) but also direct network effects (SMS, i-mail) as crucial factors for adopters. INDUSTRIALIZATION TENDENCIES WITHIN THE CREDIT BUSINESS ARE IN PARTS BROADER SOPHISTICATED THAN WITHIN FINANCIAL PROCESSES OF OTHER INDUSTRIES. CREDIT PROCESS MANAGERS OF BANKS ESTIMATE ECONOMIES OF SCALE AND SKILL ACHIEVABLE BY OUTSOURCING TO BE HIGHER THAN CHIEF FINANCIAL OFFICERS OF NON-BANKS DO. FURTHERMORE, ECONOMIES OF SCOPE, WHICH INHIBIT SELECTIVE SOURCING, ARE EVALUATED AS LESS PROBLEMATIC. Innovationsfähigkeit ist in vielen Unternehmen wichtigstes nicht-monetäres Ziel und somit ein entscheidender Wettbewerbsfaktor. Doch was macht Unternehmen innovativ? 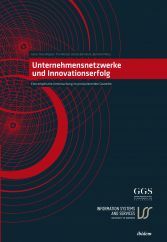 Das SENECA Rahmenwerk (Social Enterprise NEtworks and sustainable Competitive Advantage) fasst den derzeitigen Stand der Forschung im Bereich der Innovationsfähigkeit zusammen und untersucht die Bedeutung von Unternehmensnetzwerken, verschiedenen Wissensarten (z.B. Markt- und Technologiewissen) sowie die Fähigkeit von Unternehmen, neues Wissen aufzunehmen und auch umzusetzen. Eine Analyse unter 2.500 Unternehmen des produzierenden Gewerbes in Deutschland zeigt: (1) Innovationsführer zeichnen sich unternehmensintern durch besseres Wissens- und Innovationsmanagement und extern durch bessere Ausnutzung ihres Partnernetzwerkes aus. (2) Innovationserfolg entsteht aus den Faktoren: (2.1) Netzwerk (externes Netzwerk des Unternehmens) (2.2) Wissensstand (internes Markt-, Technologie-, Prozess-, Produkt- und Organisationswissen) (2.3) Aufnahmefähigkeit (externes Wissen aus dem Netzwerk dem eigenen Unternehmen hinzufügen können) (2.4) Umsetzungsfähigkeit (internes wie externes Wissen tatsächlich umsetzen können) Wichtige Ansatzpunkte zur Verbesserung der Innovationsfähigkeit von Unternehmen sind: (A) Technologie- und Umsetzungs-Know-how: In den meisten Unternehmen ist das Technologie-Know-how stärker ausgeprägt als das Umsetzungs-Know-how. Tatsächlich differenziert aber Letzteres besonders innovative Unternehmen vom Durchschnitt, womit Umsetzungs-Know-how zur wichtigeren Gestaltungsgröße wird. (B) Innovationsmanagement: Den größten Einfluss auf Innovations- und wirtschaftlichen Erfolg eines Unternehmens hat das Innovationsmanagement, welches dennoch in der Mehrzahl der Unternehmen unterentwickelt ist. Auf Grundlage einer empirischen Studie des E-Finance Lab mit den größten 519 deutschen Kreditinstituten zeigen die Autoren, dass über die Hälfte der Institute mit den eigenen Kreditprozessen und der Zinsmarge nicht zufrieden ist, ein Drittel den Anteil der gewinnbringenden Kundenbeziehungen nicht kennen, nur 7% den gesamten Kreditprozess durch ein einziges System abwickeln und nur 22% der Institute elektronische Kreditakten haben und Vertriebsmitarbeiter weniger als die Hälfte ihrer Arbeitszeit mit Kunden verbringen. Outsourcing wird dabei als wichtiger Trend gesehen, aktuell indes zurückhaltend betrieben. Im Rahmen der erwarteten Segmentierung der Bankenlandschaft möchten sich neun von zehn Banken auf den Vertrieb spezialisieren. Allerdings sind die Bereitschaft zum Fremdbezug von Leistungen und der Vorbereitungsstand gering. So haben erst 46% der Privatbanken Outsourcing-Optionen bewertet, 31% der Genossenschaftsbanken und nur 22% der Landesbanken/Sparkassen. Das Buch zeigt operationelle Verbesserungspotentiale für alle Teile des Kreditprozesses auf und identifiziert Ansätze für eine bessere Konfiguration der zugrunde liegenden Prozesskette im Spannungsfeld von Eigenerstellung und Outsourcing. Einer Umfrage unter den Top-1.000-Unternehmen in Deutschland (ohne Banken) zufolge verbrauchen die Finanzprozesse in vielen Unternehmen ein Viertel der IT-Bufgets und bieten als typischer Sekundärprozess erhebliches Optimierungspotenzial. Die Autoren entwickeln eine empirisch fundierte generische Financial Chain und identifizieren Ansatzpunkte für Verbesserungen durch ein systematisches Financial Chain Management. Tatsächlich sind die Verbesseungspotenziale durch interne und externe Vernetzung erheblich. So wickeln zwei Drittel der Unternehmen den Versand ihrer bis zu 4 Millionen Rechnungen jeden Monat über die Post ab. Dabei liegen die Kosten je Rechnung bei durchschnittlich 15,5 EUR, im Gegensatz zu 2 EUR beim elektronischen Rechnungsversand. Die empirische Untersuchung sowie Fallstudien zeigen Verbesserungspotenziale in der Financial Chain, Einsparungen durch Shared Service Factories und Outsourcing, Wege zu einem Straight Through Processing sowie Ansätze zur Reduktion der Rechnungs- und Reklamationskosten. Many stakeholders are involved in process operation and, consequently, also in process improvement and innovation. For the coordination of all stakeholders, an effective governance model with clearly defined roles and tasks can support process-oriented decision-making, which drives improvement and innovation. In this chapter, such a Business Process Management governance model is introduced. The role-based model FAR+ (Framework for Assignment of Responsibilities) provides precise assignment of process accountabilities and responsibilities. In the following, we apply FAR+ to an exemplary process at Lufthansa Technik. Based on this application, we derive implications for research and practice. How Do Planned and Actual Interaction Structures Differ in Global Outsourcing Arrangements? In: Kotlarsky, J., Oshri, I., and Willcocks, L. P. (eds. 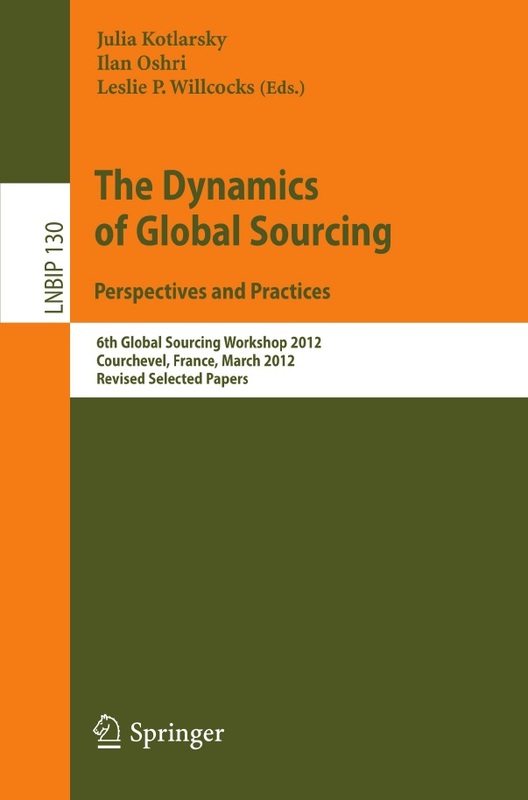 ): The Dynamics of Global Sourcing: Perspectives and Practices, Springer Verlag, Berlin, 20-38. How and why do actual interaction structures in global outsourcing arrangements differ from those originally planned? We use a social network perspective to analyze the structure of social interaction networks among operational staff and management of vendor and client firm in an outsourcing arrangement. We apply a case study approach to understand which interaction structures appear and whether they are in accordance with those structures formally defined in the outsourcing governance. We found that real interaction often differs from the plan and we provide theoretical explanations for understanding these deviations, thus contributing to the understanding of outsourcing governance and outsourcing relationship management. What is the business value of Service-Oriented Architectures (SOA) and how can we achieve it? This paper represents a conceptual piece of research which focuses on the impact of IT Business Alignment (ITBA) on the successful implementation of SOA, in terms of its business value. The contribution of this model is predominant in proposing a threefold effect of ITBA on achieving a successful implementation of SOA through the specific strategic needs defined by a particular firm in a specific industry, i.e., the banking industry. As a result, we show that the business strategy moderates the impact of SOA's general potentials on its actual business value and claim that this relationship is further moderated by ITBA, which must be thoroughly considered by practitioners deciding on introducing SOA in their firm. Die vorliegende Arbeit befasst sich mit einem neuen Modellierungs- und Analysekonzept für Geschäftsprozesse, das aus zwei Unternehmenstheorien, der Resource-based Theory (RBT) und der Competence-based Theory (CBT), entwickelt wurde. Das Konzept versteht sich als eine zu den traditionellen, prozessbasierten Darstellungs- und Analysetechniken komplementäre Methode, die das Management bei der strategischen Entscheidungsfindung - z. B. über das Outsourcing bestimmter Teilprozesse - unterstützen soll. Das als "Capability Map" bezeichnete Konzept bietet einen neuartigen Ansatz zur strategischen Evaluierung der Komponenten von Geschäftsprozessen und erlaubt deren Darstellung als ein Netzwerk von sog. Capabilities. Unter dem Begriff "Capability" verstehen wir das Leistungsvermögen (materielle und immaterielle sowie intellektuelle Ressourcen) eines Unternehmens, eine gewisse Geschäftsfunktion auf beliebiger Granularitätsebene auszuführen. Die Anwendung der Capability Map auf die Prozesse einer deutschen Universalbank zeigen die Nutzenpotenziale dieses neuen Konzeptes auf. Eine empirische Studie des Frankfurter E-Finance Lab zeigt, wie Unternehmen unterschiedlicher Branchen durch modernes Financial Chain Management ihre IT-Finanzprozesse effizient gestalten. Weitere Beiträge analysieren die Kosteneffekte durch IT-Transformation, Sourcingalternativen und IT-Investitionen im Mittelstand.